Cathedral Street and George Street are the two major routes in this District and give people access to various important civic and commercial buildings. Stirling Road and Castle Street connect the city centre to the North East of Glasgow. Both routes are used by high numbers of vehicles which means that the pedestrian experience often suffers as a result. 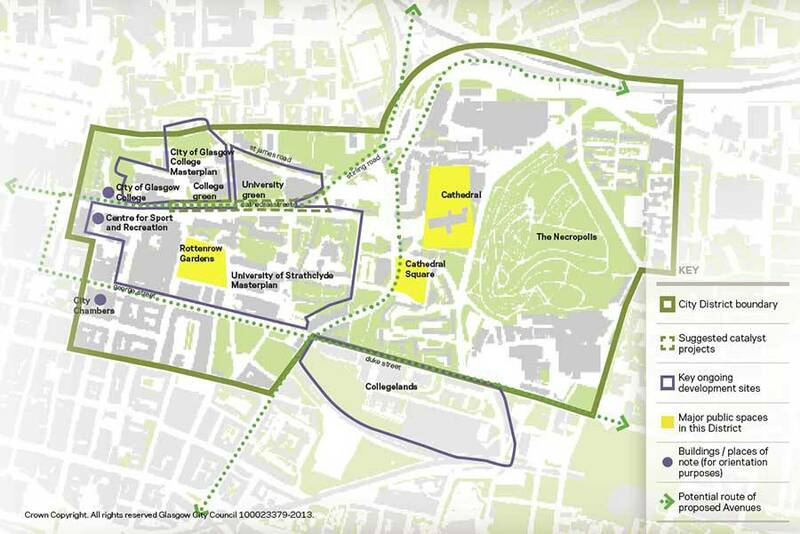 The redevelopment of the City of Glasgow College Campus makes prioritising people harder to achieve, especially during term time. These redevelopments create an opportunity to recognise the footfall and spending power which students bring and improve their experience on these busy streets. Improving the pedestrian experience on Cathedral Street, George Street and High Street will connect these key spaces and help people move around the district, which should make the benefits more widely available within the District. Find out the latest news about the Learning Quarter here.